The prospect of dramatic climate change has inspired a small industry of futuristic architecture—ideas for how our built environment will need to adapt to an age of rising temperatures and severe weather events. On Brainiac, we’ve looked at some of these plans, including ideas for how to save East Boston from the sea, and how to turn water into a positive feature of the New Orleans landscape. In that spirit, a chapter in a new book called "Imagining the Future City: London 2062" offers some useful tips for how architecture in chilly, dank London could be modified to ward off the worst effects of climate change. The piece is called "Future-proofing London" and it's written by environmental designer Sofie Pelsmakers. She anticipates that fifty years from now, two of the biggest environmental challenges for London will be reflecting heat out of the city, and improving the city's ability to handle intense bursts of rain. 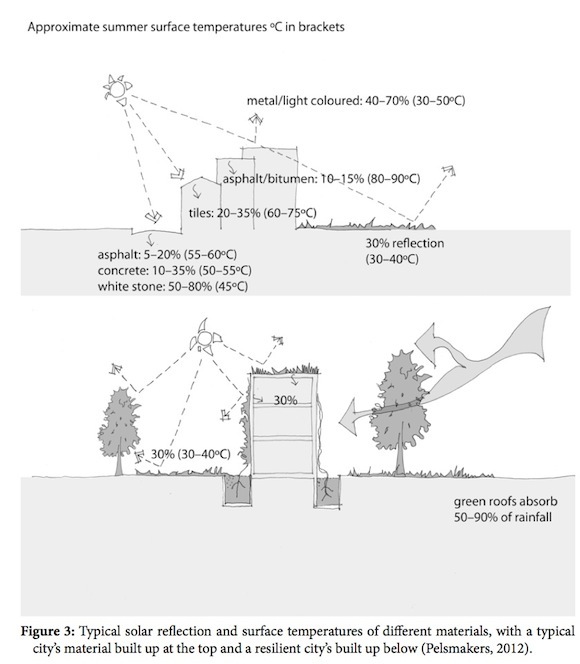 To reflect heat out of London- and temper the "Urban Heat Island effect" that explains why cities are usually hotter than their surroundings- Pelsmakers explains that London's asphalt and concrete veneer should be replaced with greenery: grass, trees, and green roofs that would reflect heat rather than absorb it. As the following diagram shows, she anticipates that those steps would dramatically reduce surface temperatures in the city. 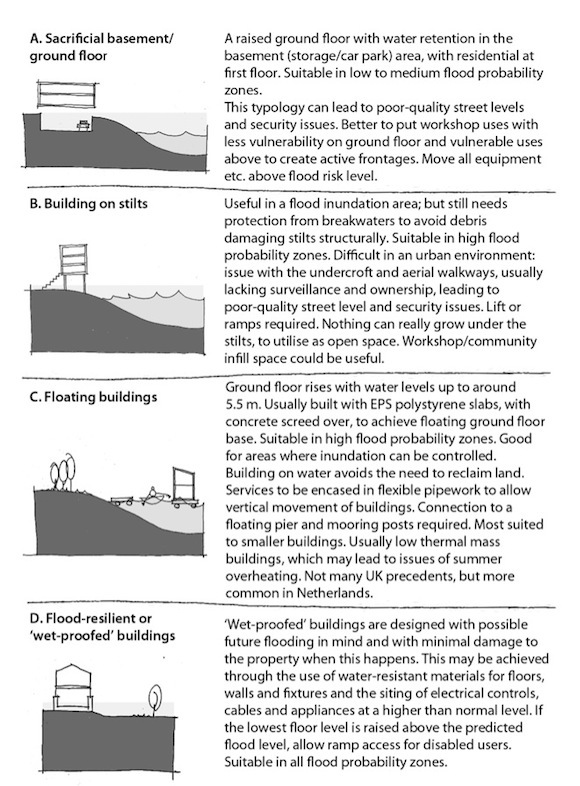 As for how to protect buildings from flooding during periods of intense, climate change-induced rain, Pelsmakers's ideas are slightly more whimsical: floating buildings, houses on stilts, and a "sacrificial basement" for collecting rainwater. All of these ideas seem far-out, but the basic idea that architecture should be informed by climate considerations is nothing new. If today we use double-paned windows and R30 insulation to keep out the cold, why in the future wouldn't we deck our walls in moss and build bladders around our houses to keep out the heat and rain?